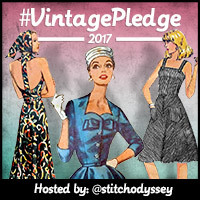 The second pattern I chose from Selvedge Shop as part of the prize for my 2014 vintage pledge is this Butterick 8609 from the 1950s. The pattern includes shorts in two lengths, a boat neck blouse and a jacket with a drawstring. I thought it would suit my summer lifestyle perfectly, and decided to make the longer Bermuda shorts so that I could appear in public in them. For the shorts and jacket I chose a white and grey spotted cotton/linen blend from my stash, left over from this dress. I was so short of fabric that I didn’t have enough fabric to make the drawstring so had to use a cord from my stash, and I had to use plain fabric for the under collar. I also had to make the sleeves shorter and attach the cuffs made from scraps, rather than making them as one piece. The blouse is from a random tiny piece of cotton lawn in my stash. It did not want to be sewn and caused me all sorts of problems, but I got there in the end. Instead of making the facings as per the pattern, I decided to use bias binding as the fabric is quite diaphanous and I don’t like the facings showing through. The blouse has tucks on the front and back and a side zip and finished up being very fitted over the ribs and has to be pulled down or it gets baggy over the bust, as evidenced below. One thing I notice about many vintage patterns is that they have high necks and the blouse in this pattern is no different. Apart from that, had I made it from nicer fabric, I might have been happier, although I do think that the loose upper body and the tight lower body creates a weird silhouette on me. Speaking of weird silhouettes, I felt really boxy in this outfit and mentioned this to a friend I was having coffee with and she suggested taking the sleeves in. I rushed home and did this and I think the outfit is much more acceptable, although I may not wear the shorts and jacket together in the future. The jacket pattern called for hand sewn eyelets. Hmm, I started to do this and then decided that I would use metal eyelets instead. I know this wasn’t very purist of me, but at least I am secure in the knowledge that my eyelets won’t fray out as the cord is dragged through. I shall be making this again, but perhaps with the shorts and jacket made from plain fabric and the blouse from patterned. I had always considered this make to be a practice run to see what needed adjusting, and I have a bit of a list! The shorts were really long in the crotch and I had to take about 4cms off the top of them, so this needs adjusting on the pattern. I still have baggy bum syndrome, so I need to work out how to take some of the excess fabric out of the back, and I need pockets on both the shorts and the jacket! When I was laying out the pattern I decided that the shorts were too small in the waist, and I added about 2cms, then finished up taking out about 4cms, so I need to work out why the measurements of the pattern and my measurements aren’t lining up. They are still a bit loose in the waist, causing them to fall down a bit in the front. I also followed the pattern directions and did not interface the waistband – why? It didn’t say to, so I didn’t. The waistband needs interfacing! I didn’t know if I would like the collar, but I love it. It’s the perfect size in my opinion, and I like the shape – even though I haven’t done myself up properly in this photo! Details: Pattern is Butterick 8609 from the 1950s. I chose to stashbust all my fabric for this, so used spotted cotton/linen blend from Spotlight and some cotton voile of unknown origins. The buttons on the jacket and shorts are from my stash and are vintage, and the drawstring and toggles for the jacket was from my Mother’s stash. The zips used on the shorts and the blouse were recycled and these, and the bias binding on the blouse were all in my Mother’s stash too. Feeling very pleased that I destashed 4 metres of fabric and lots and lots of notions! Shoes are dove nuotano gli squali. Hi there. New to your blog and want to comment that I’ve been enjoying your vintage makes and love your style. I like this ensemble, especially in the polka dots and with the red shoes (the name of the shoes manufacturer is quite cute – have never heard of it before!). Thank you Stephanie. The shoes were from their summer collection. Come to Australia and you could wear exactly this! Congratulations on upcoming nuptials. I hope you are making your dress? This is such a cute vintage outfit and you have made it totally wearable for today. Love the spotted linen. This is such a cute outfit and you wear it well! I agree with you about this collar: it is perfect in size and shape. This cropped jacket would also look fantastic with your purple ginger jeans. Wow, major destashing! You are right, the collar is perfect. And, I give you the award for blogger with the best vocabulary! I have seen the word ‘diaphanous’ but never knew what it meant — your use of it inspired me to look it up. It looks very chic Sue! but I can also see it working perfectly for a casual ensemble too. You might not be very keen on the little top but I love it! Gorgeous! fun outfit Sue! Love the length of your shorts and the collar style and fit. Oh, this IS adorable! I originally linked via Closet Case Files to see your jumpsuit which is fantastic, then saw your Ginger jeans which are awesome, and now this! Of course, you had me at polka dots…but the shorts and cropped jacket is a lovely design concept I want to try now.